The next collaboration brew from O'Hara's is Foreign Affair. It was brewed in Carlow along with the good people from Starr Hill in Virginia. Funnily enough, my mate VelkyAl from Fuggled worked there for years. The brewery is based near his home. I'm visiting Al next week so will be visiting the brewery too. I have a spare bottle to bring over for him to try. The idea here is that Starr Hill provided the American hops and O'Hara's provided the Irish malt. What did they choose to brew? A red IPA. That's right, it's a made up style but breweries can call their beers whatever they like. When they do, it becomes a thing. Sierra Nevada have a Red IPA so why not O'Hara's and Starr Hill? So how is the beer? It's pretty much exactly what you would expect. 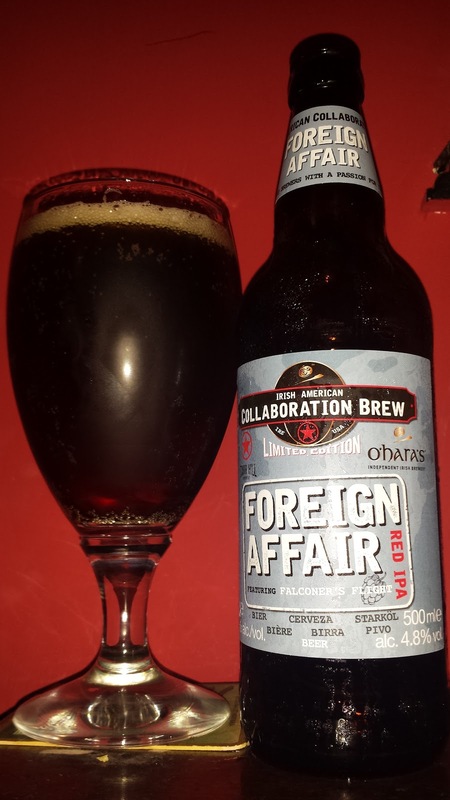 Take your typical Irish red and whack a load of American hops in to it. The base beer is pretty similar to the regular O'Hara's Red except it's a little stronger at 4.8% versus 4.3% but otherwise, it seems similar. That's not a bad thing mind, I'm rather fond of O'Hara's Red. The hops used are Falconers Flight, a blend of different Pacific northwest hops. This gives the beer plenty of citrus and pine resin notes mixed in with the rich caramel from the malt. Surprisingly, the beer is much dryer than expected. There's a long dry bitter finish with a little caramel to balance it out. It's a good beer but I feel it could have done with a little more oomph in the ABV department. 4.8% is simply too low to call anything an American IPA, no matter the colour. This beer should really have been over 5.5% to really make it's mark. Buy and enjoy this beer like the hoppy Irish red ale that it is and you won't be disappointed. Sticking with the Carlow Brewing Company but changing to a cider now. 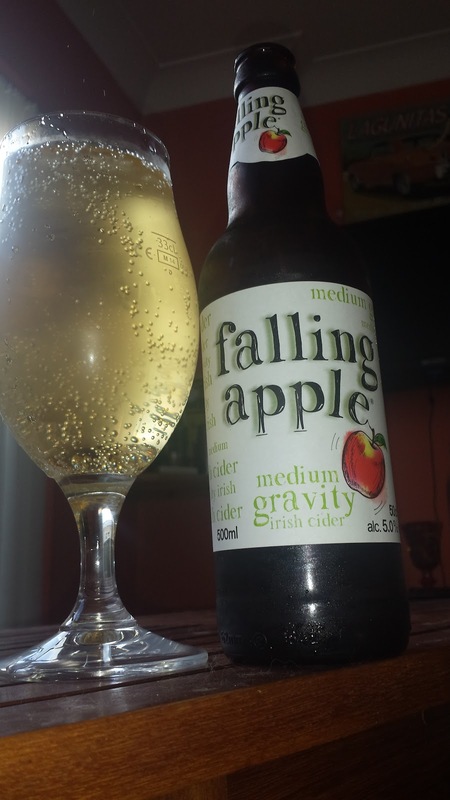 Falling Apple is a 5% thirst quencher of a cider. It's a medium sweet cider which puts it in the category of "too sweet for me". I'll be honest and say that I can't really review a cider. The most I can muster here is that it was thirst quenching, tasted like cidona and had no hint of alcohol from it. That makes it incredibly easy drinking. I couldn't finish it myself but my wife certainly could. She thinks it's great and enjoyed a number of bottles over a few days. A rather unusual collaboration brew now and one I suspect we might see more of. McHugh's is an off-licence (liquor store) in Dublin. There's one in Artane and another in Kilbarrack. I've never been in either if I'm honest. 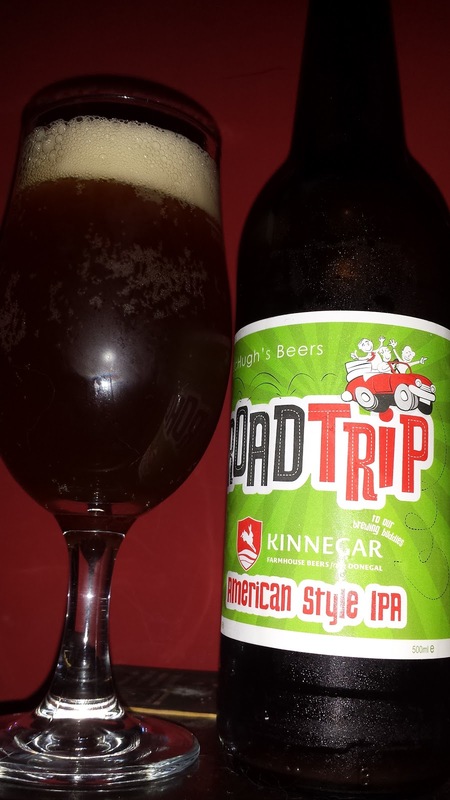 McHugh's decided they wanted their own branded beer to celebrate 20 years in business so they took a road trip to Donegal and brewed a beer with Kinnegar and called it Roadtrip. It's a great idea because the only way to get the beer is to either go to one of the shops. or order it from their website. They have an extensive catalogue of beer and other drinks available to be delivered anywhere in Ireland. The question then becomes, is it worth obtaining? The answer I am happy to say is a resounding yes. This is a real American style IPA and not just because it says so on the bottle. For one thing, Rick from Kinnegar is American. 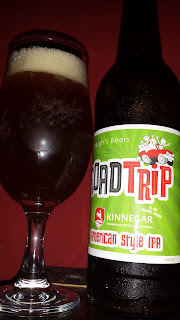 For another, Kinnegar are well known for making excellent beers that use lots of hops. At 6.2%, the ABV is bang on and exactly what I expect from an American IPA. On the nose is orange pith, grapefruit and pine with a little pepper and some grass. You can just about get a hint of malt under the hops. On tasting, there's some malt up front and then grapefruit, orange some of that peppery note. There's a long lasting, lingering, resiny bitterness. Overall, it's a lovely beer and I would go so far as to say that it's probably one of the best American style IPAs brewed in Ireland. One last thing I wanted to say. All three of these were samples sent from both O'Hara's and McHugh's respectively. As always, I give an honest opinion and never give a good review unless it's deserved. I would hope this article show this to be true.